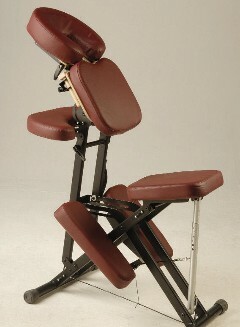 Studies by the Touch Research Institute in Miami, Florida, show that the benefits of chair massage have quick results. Immediately after massage sessions, the subjects experienced a change in brain waves in the direction of heightened alertness and better performance on math problems (completed in less time with fewer errors). At the end of the five-week study period, subjects reported reduced job stress and elevated moods. This was in addition to the usual benefits of massage, relief of muscular tension, revitalized energy, and a stronger immune system. The study's findings are significant in that the International Labor Organization stated in its 1993 World Labor Report that job stress costs the U.S. economy $200 billion annually through diminished productivity, compensation claims, absenteeism, health insurance, and direct medical expenses. The practitioner will demonstrate the procedure for getting on and off the massage chair for those not familiar with its use. Positioning is very important and the practitioner should check regularly throughout the session to be sure the client's alignment remains correct.